I don't like to brag, but I make a darn good pancake. Whether you start out with a mix or from scratch is irrelavent. Both can make some really stinkin' good pancakes. Of course, if you are choosing a mix, be sure you choose one that is as free of artificial colors and flavors as possible. Also, if you are using a mix that requires eggs and oil, try using coconut oil - it enhances the flavor and makes a light, fluffy pancake. Mix your batter as directed - do not over mix, the batter should still be a little lumpy. Once you have it mixed, leave it alone for a few minutes. Giving the batter a few minutes to breathe helps you have a fluffier pancake. I know it is a no-no in the "crunchy" circles, but I prefer to use a non-stick skillet with a large, flat bottom. I also like to use a large spatula to make sure my pancake flips without falling apart. Pre-heat your pan to just above a medium heat - not quite medium, not quite high, just above medium. I usually toss a drop of water on the pan to see if it sizzles to know whether the pan is properly heated. Too cool and you will end up with tough pancakes. Too hot and you will end up with raw in the middle, burnt on the outside. Temperature is important. Once your pan is properly heated and your batter has had a few minutes to breathe, you are ready to cook the perfect pancake. Use about half a cup of batter for each pancake and pour it directly onto the surface of the pan. Now is when the magic happens. As the pancake cooks, you will start to see small bubbles pop up all over the surface of the pancake. Watch closely. Most of these bubbles will rise and fall, pop up and then go away. 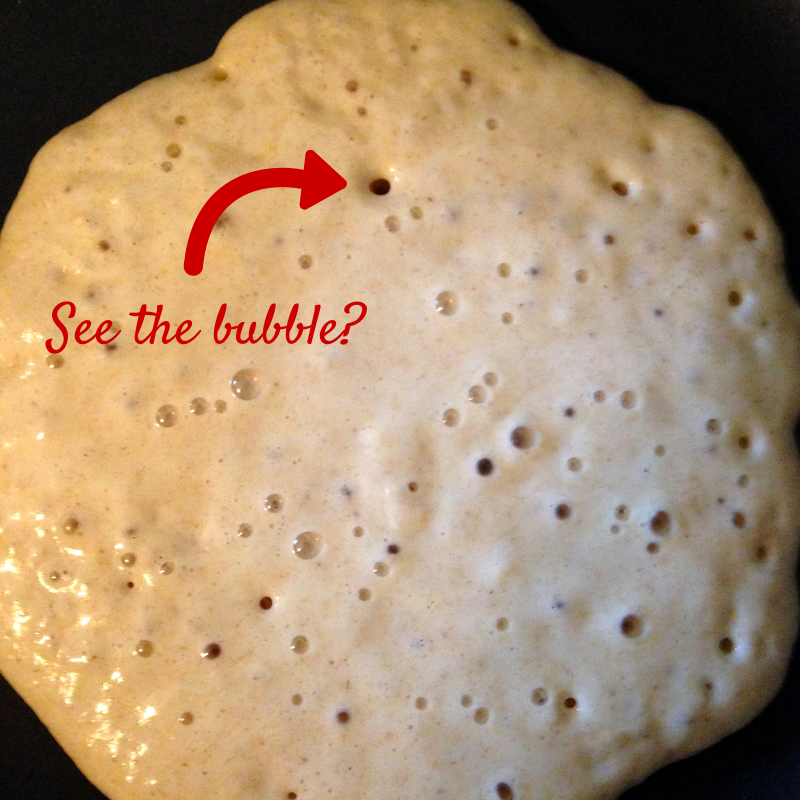 When you start seeing bubbles that STAY put, you are ready to flip the pancake. Use a large spatula and quickly flip your pancake. If you timed it right, the side that was the first to cook will be a beautiful golden brown. Let the other side cook about 1 minute. You will start to see a little browning on the edge and you will know it is time to take the pancake up. Place on a plate and butter the top, then continue cooking the rest of your pancakes. Cook some nitrate free (local is best) bacon to go with your pancakes and top with some REAL maple syrup. I like to cook my bacon first in the same pan as I cook my pancakes. Yum! Variations on a theme: Add in chocolate chips or blueberries to your batter! My Awesome New Business Cards!